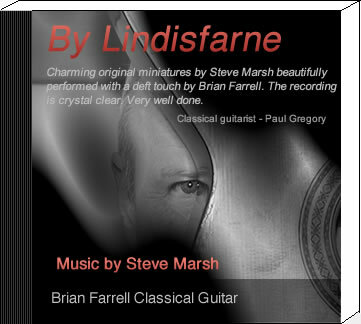 This most recent release from the talented and prolific Irish guitarist Brian Farrell is devoted entirely to music by Steve Marsh—composer of more than 300 works, publisher of many pieces for the guitar and other instruments (through his Lathkill Music), a teacher, and, yes, a writer for Classical Guitar. It’s a lovely album from beginning to end, brimming with pleasing and often haunting melodies that manage to sound at once affirmative and mysterious. The first time I listened to the CD, my mind was instantly filled with vivid images of the English countryside—so much of it has a relaxing, pastoral feeling. I looked up some of the places referenced in titles—"Callanish," an ancient stone circle on a remote Scottish isle; "The Derbyshire Suite," inspired by scenic spots in the East Midlands of England, where Marsh lives; "Lathkill," the name of a local river dale; and "Lindisfarne" (not the British band of that name I heard in the 1970s), another picturesque island with deep history and mystical connections. Marsh— and his vessel, Farrell—tap into all these places, evoking a wide variety of moods, from bucolic bliss to quiet contemplation to sweet sadness. The nine "Microstudies" seemingly depart from the composer’s concern with place, but still feel very much a part of the overall tapestry. And my favorite track may be the lilting final one, "Circle’s End," which feels almost like a capstone for the CD’s journey. The recording is superb and Farrell’s playing sparkles like morning dew throughout. 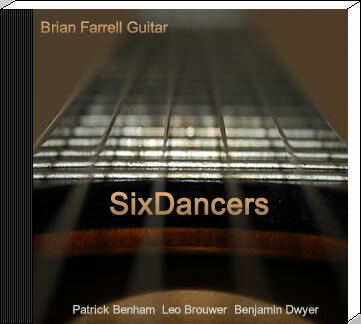 Back to Bach: Brian Farrell's delicate art of transcription for guitar completed with great success. The music of Johann Sebastian Bach (1685-1750) works on many different levels on the original instrumentation, but the introduction of the guitar brings those who deal with it to another sound-world, an entirely different dimension. When transcribing Bach from violin or cello one needs to be careful not to overpower the great composer's original melodic lines, the Dublin-based guitarist has noted. "Transcriptions then need to be carefully adopted so as to not take away from what was originally written yet as the same time, take full advantage of what the guitar can offer over the cello or violin," writes the musician. As music for the dance of that name, the 'Sarabande' is almost certainly of Mexican origin, having evolved from a Spanish dance with Arab influences. 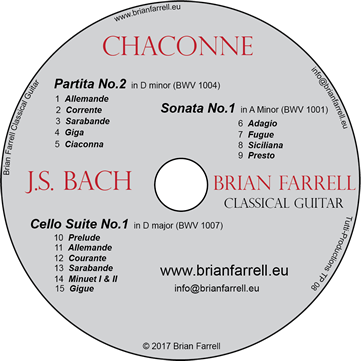 Listen to Farrell’s wonderful treatment of two Bach Sarabandes which have an Hispanic tinge you would not assume in anything composed by Bach. There is a sense of barely-compressed emotion seeping out perforce from under the super-structure in an all the pieces. These elegantly wistful constructions from the Cantor of Leipzig are handled by Farrell with perfect emotional pitch in confident, assured readings that suggest he has been playing Bach all his life. Guitars, in any case, brings us to the South, the South of Spain, and this listener heard something Hispanic too in the Sonata No in A minor, one of the most beautiful pieces your reviewer has heard on disc this year. Farrell has worked hard at this challenging project and his performance of some of the greatest music ever written is utterly masterful, as he deftly steers the craft of his instrument between the twin peaks of brio and plaintiveness. If you want too the real Spanish deal at the hands of the guitarist, check out other recent recordings from the renowned music teacher and prolific scholar of recording. 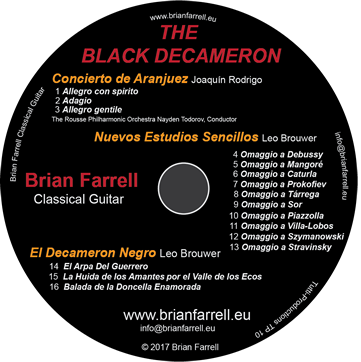 The Black Decameron CD features his splendid interpretations of Joaquín Rodrigo’s Concierto de Aranjuez, along with Leo Brouwer's Nuevos Estudios Sencillos, 10 musical hommages to ten different composers, including Stravinsky, Prokofiev, Debussy and Sor. 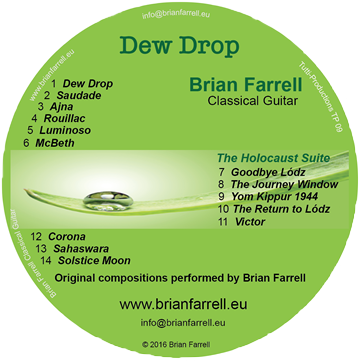 Another Farrell release, The Dew Drop includes the musician’s own beguiling compositions while By Candlelight celebrates the music of the renowned American composer Andrew York. These are important Christmas recommendations from the ever-increasing oeuvre of Brian Farrell, music that will not disappoint. Read our review of his previous album, Luminoso, here. Brian has recorded many pop favourites through his long career, collected on a previous album available from his website. 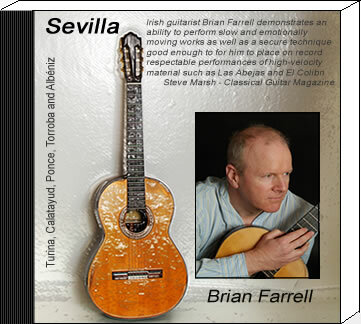 Brian Farrell is one of Ireland's foremost and respected classical guitarists, and his grasp and intuition of the rich Spanish musical legacy is very much in evidence on his album Luminoso. 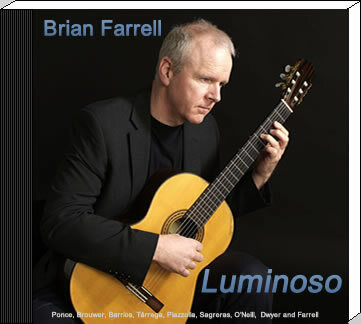 Luminoso, Brian Farrell's delightful album of solo guitar performances lures the listener in with tracks that are sufficiently distinct each from the other, a bunch of styles and approaches which showcase Brian Farrell’s amazing virtuosity. Manuel Ponce’s charming Estrellita is followed by Agustin Barrios’ Julia Florida, then Cuban composer Leo Brouwer’s plaintive Un Dia de Noviembre, Farrell’s own composition, McBeth (dedicated to Madeline McCann) and Benjamin Dwyer’s Canción para Ella. On it goes, a wealth of sensitively-recorded music and an album that you will listen to its end assuredly. Something of a prodigy, by the age of four, the Mexican-born Ponce (1882-1948) was already studying piano and his work also features on the Sevilla album, of which more anon. Agustín Barrios Mangorí’s La Catedral was inspired by the composer’s visit to the Cathedral of San José in Montevideo, capital of Uruguay. Its first movement, Preludio Saudade has a plaintive feel, its air of subdued sadness apparently relating to financial and marital problems in the life of the Paraguayan composer whose dates were 1885-1944. Julio Salvador Sagreras’ El Colibri (The Hummingbird) follows, full of joy and vitality, but with a peculiar darkness too. It’s a tremendous, visionary piece and a highlight surely on what is an album of riches. Can that be topped? Along comes Astor Piazzolla's Milonga del Angel, five minutes of rapture in Farrell's expert hands. Francesco Tárrega (1852-1909) is largely credited as the founder of modern classical guitar technique. His Recuerdos del Alhambra (Memories of the Alhambra) is his best-known composition and arguably the best known Spanish guitar piece the world over. Farrell serves it exceedingly well and it is followed by his own iridescent, sun-lit title track, Luminoso, a winning piece, shimmering beauty. The Sevilla album, which runs to approximately 45 minutes, opens with Joaquin Turina’s Homenaje a Tárrega, which features knowing musical nods to the work of the composer Turina (1882-1949) was born and studied in Sevilla and during his time in France was friends with Maurice Ravel and Claude Debussy. Bartolomé Calatayud’s Suite Antigua is given a spry treatment. Calatayud hailed from the island of Mallorca, and was taught by the aforementioned Francesco Tárrega. Manuel M Ponce’s Sonatina Meridional opens almost dourly but graduates into a bitter-sweet asperity, ranging in its moods through neo-classical, neo-romantic and impressionism. We are clearly not in the city of Sevilla – to refer to the album’s title – in the course of the first two movements. Yet by the third, Fiesta, we certainly could be standing, or better still, dancing by the banks of the Guadalquivir. Federico Moreno Torroba’s Suite Castellana begins with the haunting Fandanguillo, followed by the wistful Arada and to complete the three movements, the elegant, charming Danza. The music of Torroba (1981-1982) is followed by excerpts from Isaac Albéniz’s Suite Española, on which three cities are saluted, Sevilla, Granada and Cádiz. 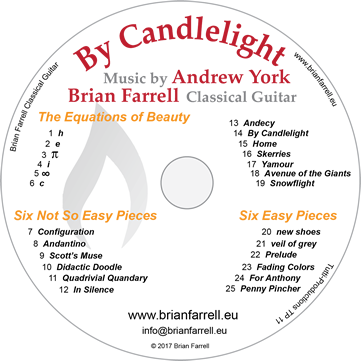 These two albums comprise wonderful selections, interpreted with admirable skill and imagination by the Dublin guitarist. 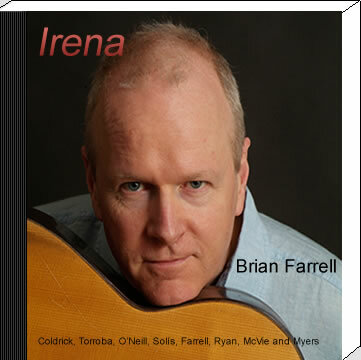 Presenting a ‘showcase’ programme of mostly standard material, Irish guitarist Brian Farrell demonstrates an ability to perform and emotionally moving works as well as a secure technique good enough for him to place on record respectable performances of high-velocity material such as Las Abejas and El Colibri. 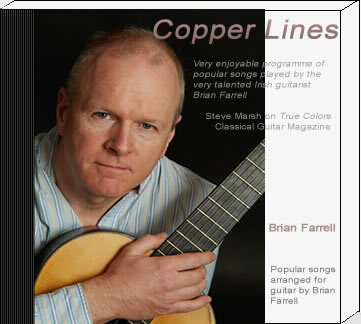 In this programme he also displays his talents for writing a couple of self-penned compositions, which are in no way diminished sitting along-side more celebrated guitar works. In particular his piece McBeth, written as a homage to the tragedy of the missing young girl Madeleine McCann, is a little gem of a piece. (Astonishingly on the day of beginning to review this disc, it was announced on the news that the British police are once again opening up a case after nearly seven years). A very nice new release of guitar music favourites and one or two unknowns: all well recorded and played to a high degree of respectability. Older readers may well remember the name Patrick Benham being associated with handwritten photocopy (actually ‘xerox’ would probably be more accurate term) of his Elegy and/or Rumba (later renamed Cubana once it was officially published), as these two attractive student pieces seemed to do the rounds of most guitar teachers. Of the eleven titles included in this programme ten of them date back to the 60’s, 70’s and 80’s and, like the two aforementioned pieces, are tuneful little ditties well deserving of more popularity than they seem to have received. The Eight Simple Studies by Benjamin Dwyer seem too, solid, technically enhancing student material, none of which outstayed their welcome and are quite attractive. Considering the importance and popularity of the twenty guitar studies by Leo Brouwer they seem relatively sparse recorded in their entirety. The inclusion therefore on this programme is to be welcomed but unfortunately it is something of a mixed bag. For the most part the studies are well played and interpretation but what lets the side down is Brian Farrell over-zealous speed on number six (surely one of the most popular of the set) and number twenty where both are taken at such a breakneck tempo thats makes for uncomfortable listening (and the rhythm between bars is not maintained in the former one). There is also a rhythms discrepancy between what is on the printed page and what is actually played in number sixteen concerning the 32nd notes in the bass line. Due to their unfamiliarity and attractiveness this recording is with getting hold of just for the Benham and Dwyer pieces alone. Charming original miniatures by Steve Marsh beautifully performed with a deft touch by Brian Farrell. The recording is crystal clear. Very well done. 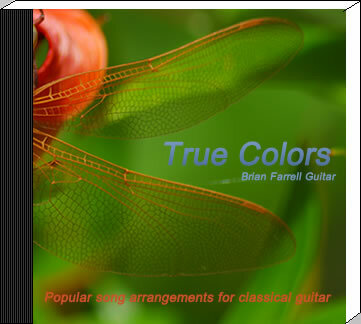 Brian travels comfortably over a varied musical terrain – from traditional Spanish guitar repertoire to arrangements of standards and contemporary hits. His mastery on the instrument produces a stellar performance every time and guarantees the listener an aural delight. His prolific output of seven CDs displays this wide range of material and his recordings feature regularly on the Blue of The Night.